Part of any government’s business is to speak with and listen to their citizens. One of the more formal ways that government does this is via consultation. 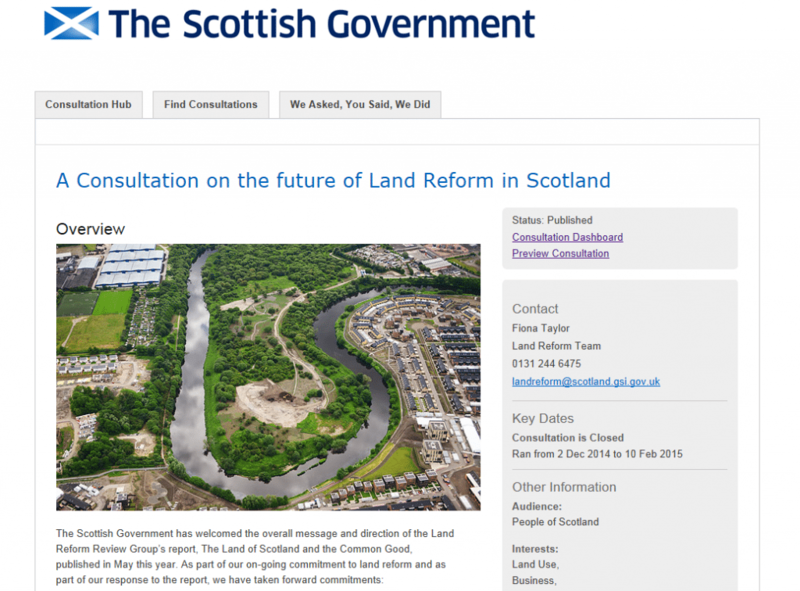 The Scottish Government runs around 100 consultations a year, on a wide range of subjects. The consultation process is designed to allow people a chance to have their say on government proposals or policies. However, there has been a growing recognition of the limitations of the current consultation system. With this in mind, the Digital Engagement Team has adopted a new platform for our consultations and has developed new consultation guidance. The Scottish Government is now using Citizen Space, a user friendly online consultation tool by Delib, designed to improve the accessibility and transparency of our consultations. Citizen Space acts as a hub for all upcoming, active, and closed consultations, providing a space for people to have their say on current issues as well as an accessible archive for previous consultations. The platform provides a wealth of options for consultations, with a variety of question formats, the ability to embed all sorts of media, and a powerful search tool, all combining to improve the consultation experience. In addition, all public responses are readily available , as well as succinct summaries for consultations under the ‘We Asked, You Said, We Did’ tab. This will be our platform for all government consultations in the future. Combined with our new guidance, we hope that Scottish Government consultations will be simpler, easier to access and facilitate better communication between people and government. Being a new and unfamiliar system, we felt it was important for our colleagues to get to grips with using it, and who best to make that happen but the team responsible for creating it? To this end, the Digital Engagement Team hosted Ben Fowkes and Louise Cato from Delib, a company who specialise in ‘digital democracy’. They work exclusively with central and local government and have helped roll out Citizen Space for a number of local authorities across the UK. Over a couple of days, Louise held sessions for Scottish Government staff on Delib’s consultation system Citizen Space, as well as their idea generation platform, the Dialogue App (stay tuned for more detail about this in the future!). Afterwards, she joined up with her colleague, Ben, along with representatives from several local authorities and public bodies to run a Citizen Space user group session. This tool will help the Scottish Government better engage with people across Scotland. The initial sessions were designed to help our staff develop a more thorough understanding of why we are using these tools and how to get the most out of them. Judging by the some of the feedback from attendees, there is quite a bit of interest in working with Citizen Space. We’re encouraged by the enthusiasm we’ve seen from staff, and excited to see what they can come up with! The user group workshop was a success, too. There were representatives from SEPA and Edinburgh, East Lothian, East Renfrewshire and Clackmannanshire Councils. We exchanged tips on how we’d run different types of consultations in the past and got the most out of Citizen Space’s features, with SEPA’s consultations in particular garnering praise for their fantastic graphical design. It was certainly useful to hear about the issues that other users had encountered, and exciting to see how users are encouraged to collaborate and share their experiences. With sessions like these, the Citizen Space community can develop into a really useful resource, helping improve the consultation process and public engagement too! You can see the Scottish Government’s Citizen Space hub, along with any open consultations here.